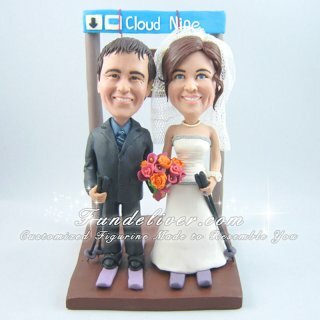 This is a completely skier theme wedding cake topper ordered by one of our customers. Their images and instruction are so good and detail to help us make their ski cake topper better. So we just put their instruction here with no edit. Hope this could be a sample for our future clients to know better about the instruction and reference images. 1) As the background, we would like you to incorporate the "Cloud Nine" sign that is attached as a photo. It is the theme of the wedding. Is it possible to raise up the Cloud Nine sign and then have a smaller brown sign hanging below it that says "Matt and Jodi March 28, 2010". We would like our names on there to be very visible. 2) We are the same height. 3) The dress in the picture has not yet been altered, so it is too long - please make it shorter so it is the length of a typical wedding dress and you can see the skis! 4) The back of the dress is a criss-cross lace-up style that will be a bit wider than it is in the picture after it gets altered. 5) The bride's hair will be up with the flower and veil placed similarly to those in the attached pictures. 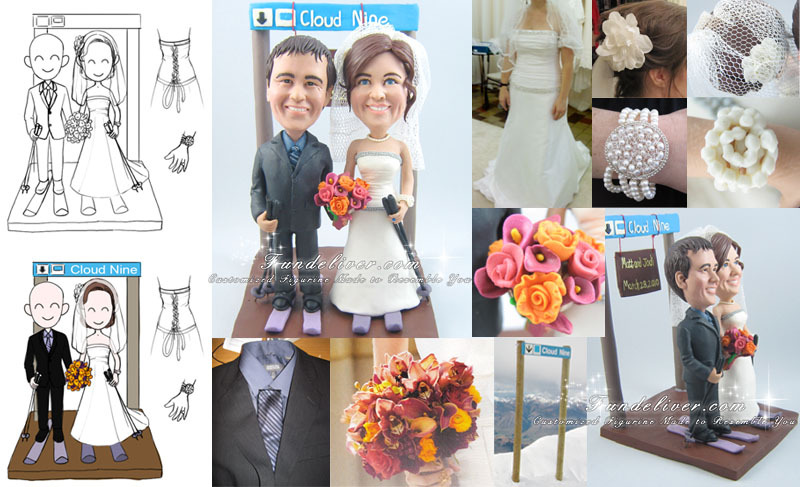 6) The clothes we are wearing in the pictures are the clothes we want in the cake topper. 7) Facial Expression - We both want to be smiling. 8) Pose - We want to be standing next to each other holding hands with the flowers between us and the "Cloud Nine" trail marker in the background. 9) We both want to be wearing skis and holding ski poles. 11) The flowers are burnt orange and deep purple, there is also a scanned in picture of the flowers. These are close to the bride's flowers - but there are no roses. The flowers are deep purple and burnt/flame orange - calla lillies and orchids similar to what is pictured. 12) The bride will be wearing the bracelet on the hand holding the ski poles. These are all the information about how they picture their skier wedding and cake topper. Remember the better reference images and detail instruction you offer, the better cake topper we can make to match your wedding.